Autumn is here. The leaves on the trees are starting to change colors – gorgeous shades of red, bright orange and yellow. Mövenpick ice cream stands have been replaced by Brezel König (large, soft, salted pretzels). And the little green huts selling heissi Marroni (roasted chestnuts) are soon to be showing up all over town. At the markets, plums, apples, pears and all sorts of root vegetables have taken center stage. 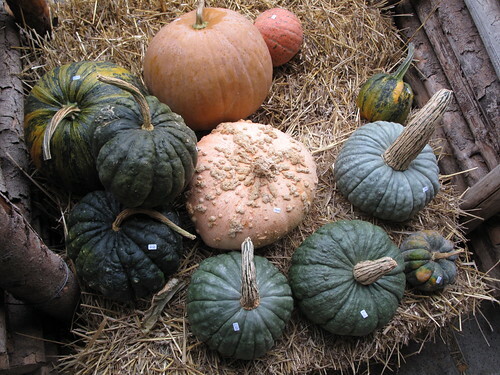 And the most exciting displays of all are the pumpkins and gourds in all sizes, shapes and colors. I love all types of winter squash. As many different varieties as there are, and fun names to go with them, there are just as many ways to cook and bake with them. 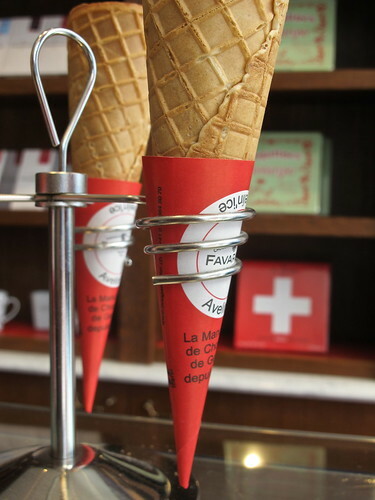 Amazing how each one can have such a different flavor and texture. 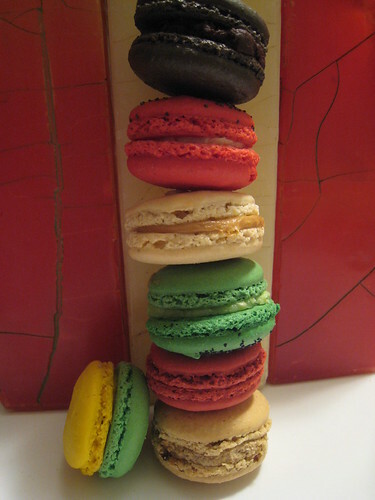 Grab a Blue Hungarian, a Turk’s Turban or a Baby Boo, or try a Red Hokkaido, a Jack Be Little, or a Muscat de Provence. Decorate your home or garden, or pile them up on your table. Just don’t forget to bring them into the kitchen… and experiment. You can probably imagine my excitement when I learned about a farm with 150 pumpkin varieties – 15 different types of Butternut squash alone! 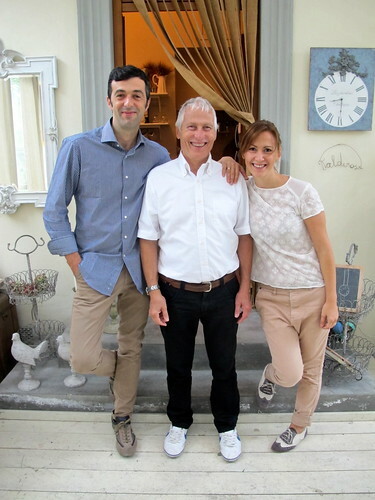 My friends Jack and Silvia of Laughing Lemon (that’s them below)- and experts on the subject, invited me to join them. This time last year I had taken their “Cooking with Pumpkin” class, and here was their source for all those amazing looking legumes. To the Baur family farm we went in Berg am Irchel, about 40 minutes north of Zürich, through wine country, past endless green fields with tons of grazing cows and sheep. Unfortunately, we missed the harvest the weekend before when the Baurs were out in the farm collecting all these beauties. 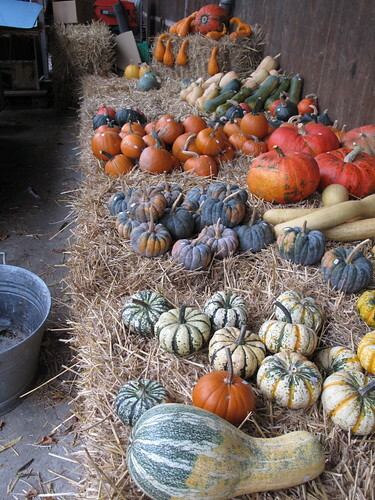 It reminds me of going to Young’s Farm or especially Martin Viette in Long Island, New York with my sister when we were kids, picking our own pumpkins (the largest and most perfect, that neither of us could lift of course) and going for hay rides too. But those pumpkins weren’t quite for eating, as much as carving and painting. 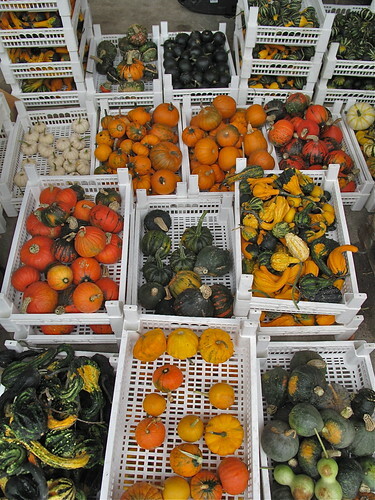 Here we gazed at the neat rows of squash laid out on straw or in the crates piled up, with a different motive. Instead of Halloween,… we were thinking dinner! At the end of the day, I went home with a colorful (and heavy) selection of 19 pumpkins – and trust me, it wasn’t easy to narrow it down to only that. It sure seemed like a lot, until compared with Jack and Silvia’s whopping 63 pumpkins ! I wonder if they can name all of them ! Even though I love the look of each and every one I chose below, it’s time to get cooking ! I’ll be checking my notes from last year’s pumpkin class for ideas, but please don’t hesitate to share yours here too. Thanks ! What is your favorite type of pumpkin ? And how do you cook or bake with it ? 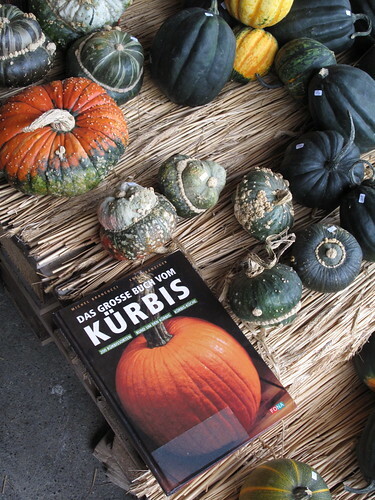 * Bergener Kürbistage – 14th Annual Pumpkin Days ! Gourds are a total mystery to me. I tend to fall back on Butternut Squash because I know the flesh will always be smooth and sweet. 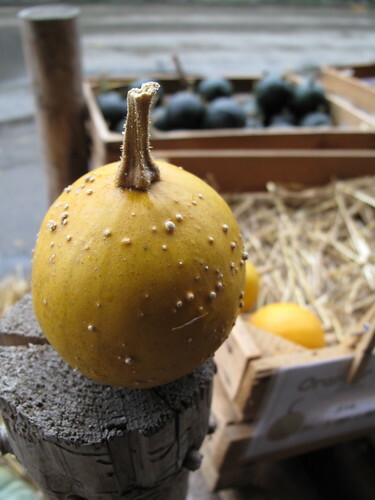 I have had a few bad experiences with really watery pumpkin that tasted…quite odd. I would also love to hear what other varieties people like / cook with! Great post! 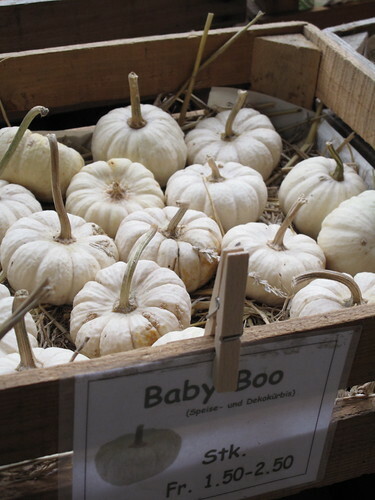 I love seeing all the different pumpkins at the market this time of year. 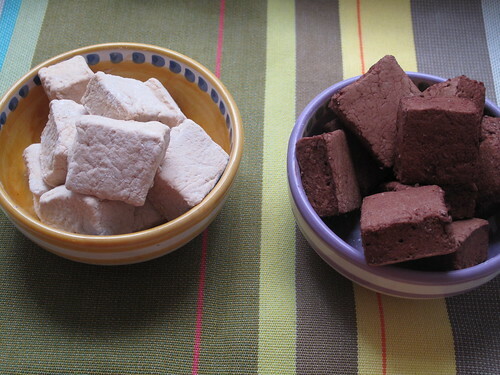 Last fall, I couldn’t get enough of making (and eating!) pumpkin gnocchi with brown butter sage and parmesan, yum! Wouah, juste seems like Automn is back!!!! I have no idea where to start with gourds. 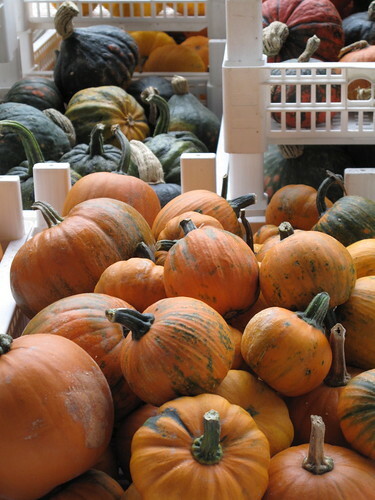 I usuallly stick to squashes like butternut, acorn, kabocha, and pumpkin. mayssam, merci ! Mmm, pumpkin gnocchi sounds sublime. Have a favorite recipe you want to share ? Samantha, I love your selection of squash, how do you usually prepare them ? Lani, thank you ! 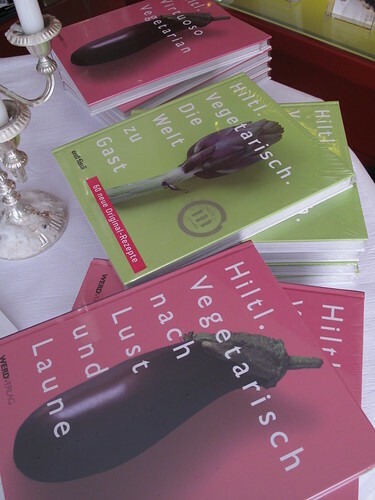 And me too, I love autumn and the change in seasons now – especially at the market with all this good stuff to cook with. Have fun at the Greenmarket in NYC; I bet there will be a fabulous and colorful selection there too. Can I name all the pumpkins on my farm table above ? Nope. Anyone want to help me ?? 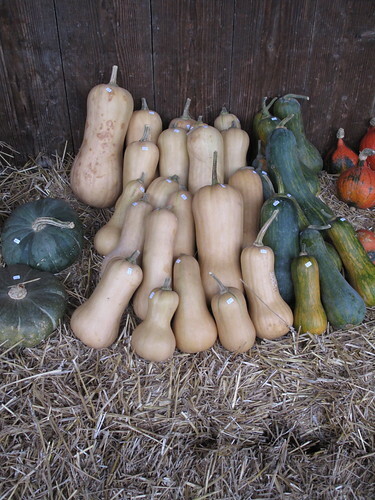 I see three Butternut squash, a Baby Boo, a Blue Hungarian, a few different types of Acorn… a Kabocha perhaps. 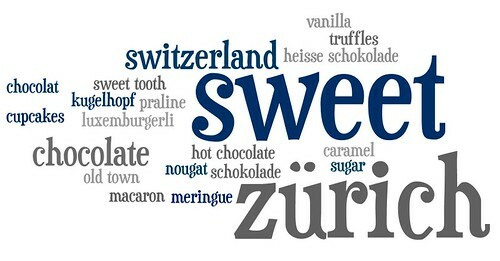 Hmm, what else ?? I’m not a big marrow fan, to be honest. I suffer through winter squash on occasion, but it’s just not my bag. 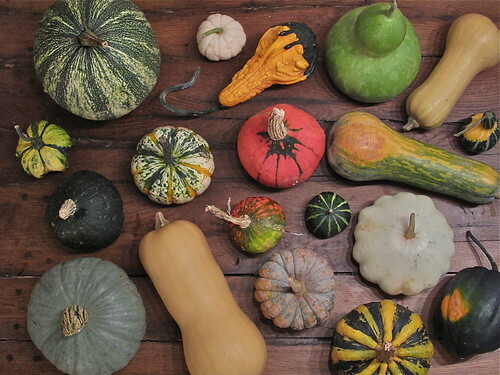 However, I loooooove to decorate with gourds! I have one from last fall in my living room that miraculously hasn’t succumbed to rot or mold. How it’s still going strong mystifies me, but I’ll roll with it, because it’s pretty cute. Two mini pumpkins made their way into my kitchen last week, to adorn my stovetop for the next few months. 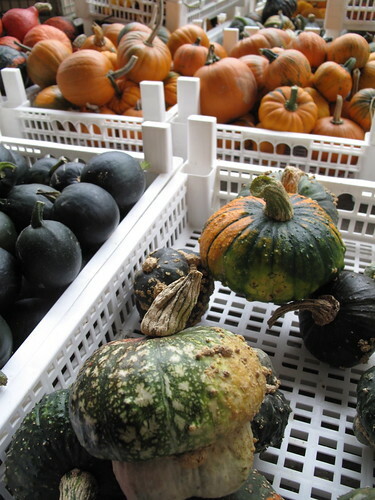 And some cucurbits do capture my fancy, including blue hubbards (nice color), zucchini (the only one I really like the taste of), and snake gourds (shock value). 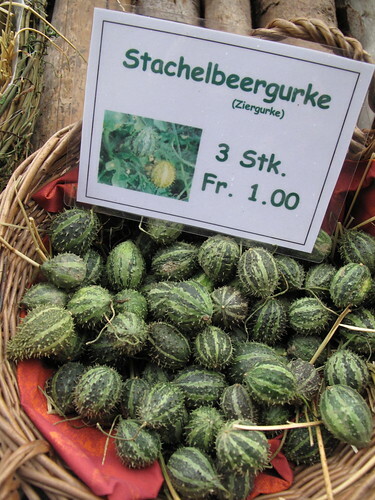 I like the looks of the Stachelbeergurke, but every time I look at the above image, my mind thinks “beer gut” instead! Beautiful! 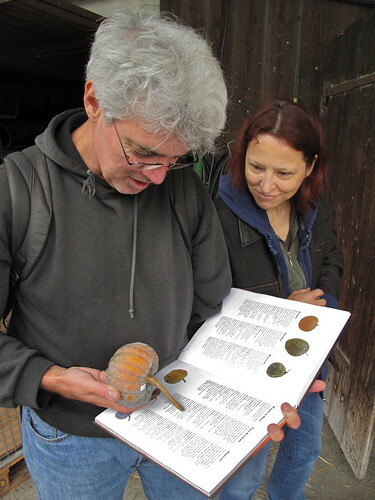 Have you been to the Jucker farm in Seegräben? 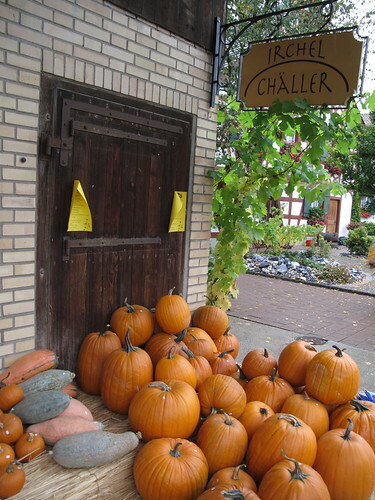 They have an amazing pumpkin display every year and soon they will weigh the champion pumpkin (usually around 300kg or so 🙂 They also have a pumpkin race on the lake but I always managed to miss that event..should be fun though. 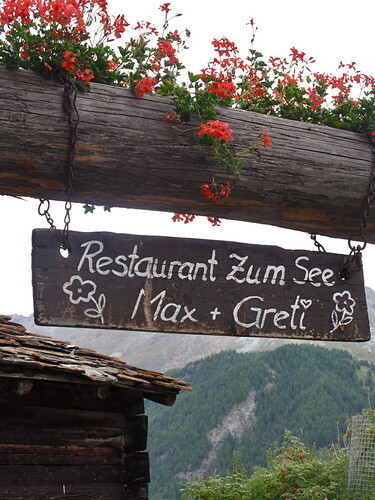 They sell a lot of nice products and it’s a nice place to have coffee or brunch with a view on the Pfäffikersee. 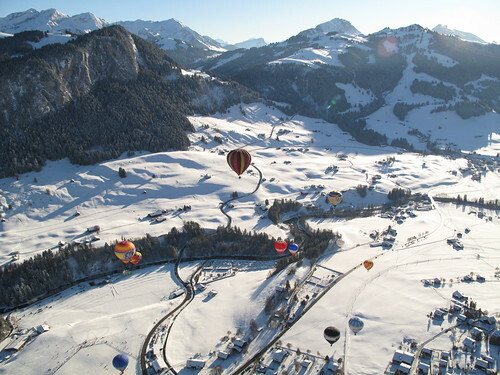 On Sunday afternoons, it’s absolutely jam-packed with people so not the best time. A wonderful riot of colours. Love the shapes too. Loooove the title! You’ve motivated me to make soup this afternoon out of the last summer squash left on my shelf. Honestly, Kerrin I didn’t need to read a word of this post, the pictures were enough. 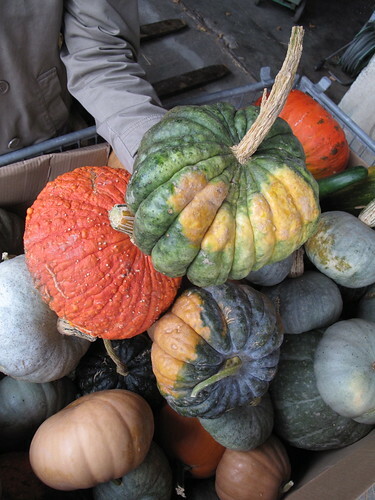 I just love the color, texture and variety of gourds. Your pictures captured the beauty of fall – a feast for the eyes. Thanks. Caroline, oh my !! Look at those pumpkins – or rather, look at those dinosaurs ! 🙂 Thank you so much for sharing. 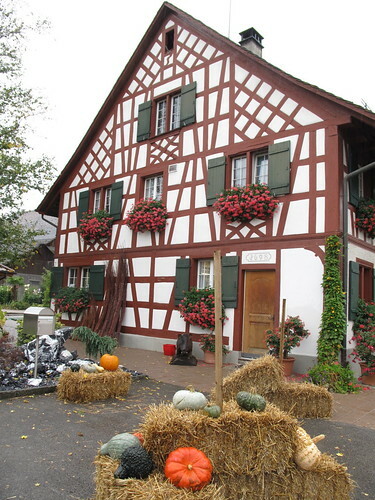 I have heard of the Jucker farm, but didn’t know about their pumpkins. I sure hope to get there one day. Really appreciate you sharing the link, such fun ! Katrin, mmm, soup ! 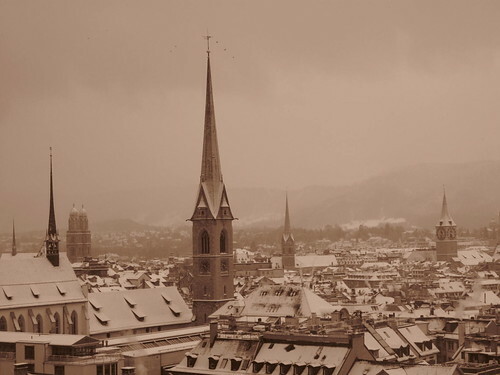 With this weather in Zürich, that sounds perfect. Brrrr. katy, so glad you enjoyed the photos ! Thank you. Oh, my, that’s beautiful. I only came back from the squash farm with butternut, acorn squash, blue Hubbard and Pink Banana. But when I look at this, I just want to go back! Especially since I made soup this weekend with the Butternut and Acorn that was to die for. You may be responsible for my next shopping spree, lol. I’m a fan of roasting the pumpkin seeds. Maybe this year we need to experiment and do something more substantial with our harvest. Lynne, a Pink Banana ?! What a name, haha ! 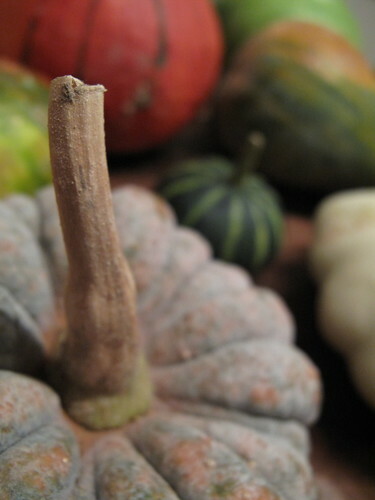 I just looked at your blog, what fantastic photos as well, and amazing looking squash. Your soup looks outrageous. I’m not usually a fan of curry, but this just looks too good. I’ll be making it soon for sure, thank you so much. I’ll be responsible for your next shopping spree, and you’ll be responsible for my next batch of soup ! Good exchange, haha ! Wayfaring Wanderer, such an excellent idea. A great snack, and nothing goes to waste then. Have fun experimenting, let us know if you come up with something delicious ! I just discovered your blog, and I love it. I too am passionate about food and travel, and I look forward to reading more of your posts! This is my third day of trying to think of squash-based recipes to recommend… I just don’t have any. 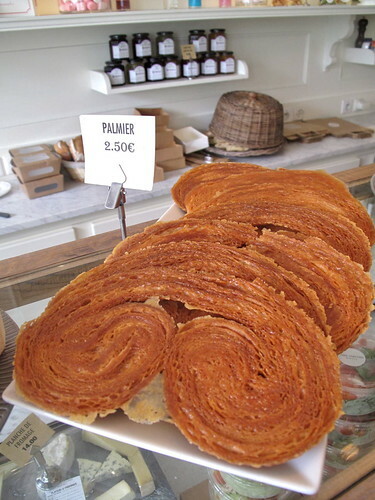 But I did think of a recipe that I’ve had in my repertoire for years, but have never yet made…. New Age Ravioli, according to the video! Oh Martha, she’s so bluntly hilarious. 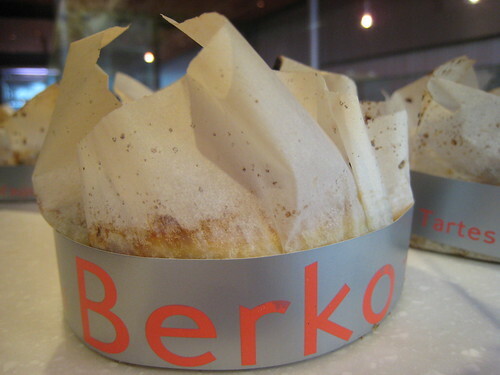 Anyway, these seem tasty; I really should try them out soon. Oh my gosh, I never realised there were so many types of pumpkin. I love the humble roast pumpkin as a side to a delicious roast meat meal. But I am also quite partial to a fabulous pumpkin and date scone. Sounds good with dates, too, huh? The recipe is by one of my favourite Australian cooks, Belinda Jeffery. I’ll have to get the recipe to you. Delicious!!!! Emma, thanks for racking your brain for us. And what a find that is – new age ravioli ? Just watched the video, thanks so much for sharing. Martha is a riot. Meanwhile though, butternut squash Parmesan jelly ? New age indeed. If you try it, definitely let me know how it goes. I like the idea of juicing the squash to use the liquid for sauces, great idea. Just need a juicer… ! Julia, and HELLO to you ! 🙂 Amazing, right – can you just imagine a farm with 150 varieties ?? I thought 10 was impressive. Meanwhile, did you just say pumpkin date scone ? YUM ! I totally remember you telling me about that, way back when, and I still patiently await the recipe…. ! That is a definite for this fall, thank youuuuu. Oooh, just found it – is this the same recipe you used ?? Looks good to me, but no Medjools, that’s too bad – those are my favorite date by far. Actually didn’t need to go on another shopping spree, my organic farmer brought 3 more squash in my last summer basket. Of course, there’s no saying where impulse will lead me, I just bought a whole organic lamb from another farmer, hubby is tearing his hair out!